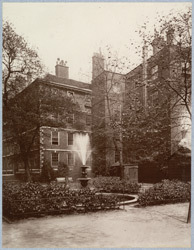 Fountain Court is situated in the Middle Temple, near Middle Temple Hall. "Readers of these notes will not need to be reminded that this spot was a great favourite with Dickens. Here it was that Tom Pinch, coming out of the Temple used to meet his sister Ruth. (Martin Chuzzlewit, chap. xlv.)"